It seems like ever since Kodak introduced its rough-around-the-edges pigment inkjets, HP has been playing catch-up in the inkjet game. They countered Kodak's claim of less expensive prints with bundled consumables and green packaging. And with the C4600 series, they're even mimicking Kodak's latest black ESP series inkjets with a glossy black inkjet of their own. 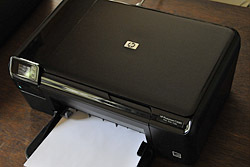 Both the Kodak ESP series and the HP C4600 series are all-in-one devices, like the Canon MP series we recently reviewed. These printers can print what the manufacturers like to call "lab quality" prints (we actually find them much better) from your computer or right at the printer using at least a built-in card reader. But they are also scanners, so you make copies of not just your last income statement but photos, too. Two Views. Top image shows height of the compact unit while the bottom shows its depth. And they don't cost very much. The HP Photosmart C4680 is just a penny under $100, in fact. That works not just for the home office but for the dorm room as well. In fact, HP has always been an attractive choice for the dorm room. 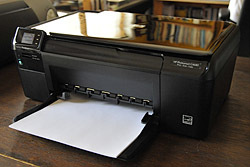 The company's all-in-one printers (a scanner at school will make friends for you) have always been among the least expensive printers (not to mention all-in-ones) you can buy. We took a look at the new C4680 recently, putting it through a week (or two) in our print-happy life. Ask HP what's special about the C4680 and they'll tell you how the SmartTouch frame makes this complex device one of the easiest to use. The low price doesn't hurt either. And the compact size and attractive design and big pluses, too. It does not do duplex printing. So you only use one side of the sheet. It is not PictBridge compatible. So you can't plug a USB cable into the front to print from your cable-connected camera. It connects to other devices via USB only (no Bluetooth or WiFi). It's a four-color printer with just three color inks. This isn't a big deal with a small picoliter size but HP doesn't publish what size dot this printer can produce. That's odd because it certainly seems to be small. The company is betting those features, available on competing products, don't matter to you. Print Speed: Vary according to the document, HP coyly says. Not fast, we say. Image Quality. These 4x6 prints on top of the black scanner lid exhibit the C4680's image quality issues. The steeple was printed directly from the card reader. The larger bottom portrait is a copy of the print behind it (note it is a bit lighter). And the black and white with the magenta cast is another scanned copy. Supported Media: Memory Stick, Memory Stick Pro, Memory Stick Select, Memory Stick Magic Gate, Memory Stick Duo or PRO Duo (with optional adapter), Memory Stick Micro (adapter required) in slot 1. xD-Picture Card, SD Memory Card, SDHC MultiMedia CardCard, MultiMediaCard, MultiMediaCard Plus, SD Mini (adapter required), MMC Mobile (adapter required), TransFlash MicroSD Card, Secure MultiMedia Card in slot 2. One of the problems with new printer models is finding consumables (although, as we write this, PriceGrabber lists only one vendor for the printer itself). HP makes a number of papers suitable for its all-in-ones, of course, but ink cartridges and bundles with photo paper can be hard to find. We did find a Combo-pack for both the Number 60 black and color cartridges listed at Best Buy for $31.99. That's about the cost of either a black or color cartridge for the company's PSC all-in-one series. A Number 60XL set with higher capacity is, apparently, also available. The Best Buy site lists 200 black or 165 pages per cartridge and notes the color cartridge contains cyan, magenta and yellow ink. We went through ink very quickly on the C4860 -- just a handful of photos (8x10 and 4x6) and maybe 50 sheets of paper (on which we printed lots of photos). If indeed XL cartridges are available, we'd recommend them. No USB printer cable is included with the unit. The compact size and striking good looks are what first appealed to us about the C4680. We were less enamored of the glossy black body design when it became clear it would rarely be observed without a light coating of dust (not to mention fingerprints). We weren't about to wipe it down twice a day. Unboxing Gallery. Our unboxing gallery provides a nice tour of the hardware, too. The small paper tray folds up, covering the cartridge access area when not in use. It isn't designed to sit open with a stack of paper, apparently. A fold-out tray extender accommodates quite long sheets (but be careful to close the paper stop at the end of it before closing it up). The paper path makes a sharp U-turn in the print, which doesn't accommodate thick sheets. Printed sheets fall on top of the unprinted sheets in the paper tray. 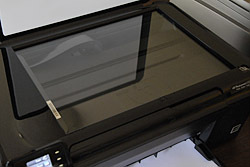 The scanner lid has a replaceable white lid-backing but does not lift up to accommodate thick books. There is no scanner lock to protect the camera when moving it. That doesn't mean it will be damaged, just that you don't have to lock and unlock it. On the front left there is a card reader just above the blue, illuminated power button that supports just about everything but Compact Flash cards in two slots. And above that is a jewel of an touch-sensitive LCD. And by jewel, we mean small. The LCD screen is just 1.5 inches diagonally, although on both sides of it the TouchSmart frame has three touch-sensitive buttons to make that small size a little more functional if exceptionally hard to see for older eyes. The power port as well as the USB port are on the back along with a rear door in quite a large cavity to remove paper jams. There aren't many options to worry about when you install the C4680, so it went pretty quickly. See our unboxing gallery for visuals. Software Install Gallery. Not too bad, after a little confusion about finding the printer. We followed the large step-by-step guide, removing the protective film and tape (don't forget to look in the rear cavity for the tape that secures the removable rear door). It may just have been our model, but we were surprised to find that some of that protective film was trapped behind things like the orientation icon on the scanner. Not quite the fit and finish one expects these days, even on an inexpensive device, because it speaks about both design and quality control. What you don't want in an all-in-one is any problem down the road. You want the reliability that brand name promises. So it's disconcerting to see something like trapped protective plastic. We're not a fan of the brick adapter design (can't they stick that inside the printer?) but the long power lead at least let us hide it. The brick itself has a green LED on it, which is particularly useless if you hide it. Canon seems to be the only guys who get this right. HP Studio. A nice application, if it got confused about how to handle (or not handle) the card reader. This is the edit screen. Cartridge installation was not as easy as it should be. You're forgiven if you feel like you're breaking the printer to get the cartridges in. And you just might break it. Don't push the cartridges in at an angle. Keep them upright and slide them straight in on the small shelves on either side of each cartridge bay. Then give them a good, forceful shove until they click into place. After installing the cartridges, you have to align them. 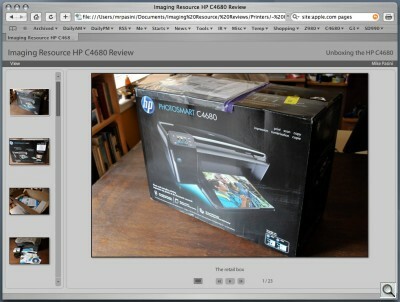 HP does this very nicely, as our unboxing gallery shows. You simply load some letter-size paper in the paper tray and follow the instructions on the LCD to print the alignment page and then scan it. That's all there is to it. Then comes the software install, which we've also documented in a gallery. It was very easy and didn't require a restart, loading HP's suite of applications and a TWAIN driver for you image editing application as well. A couple of software daemons are installed on the Mac, too -- a trap monitor and an event handler. The whole process takes about half an hour. It's not the fastest (or the quietest) all-in-one we've tested. We didn't time it, but were surprised at our own impatience waiting for the thing after using both the Kodak and Canon equivalents. A 4x6 took well over a minute to print, which is how long it takes us to get through the mail each day. Main Menu. Scan, Photo or Copy. Note the touch-sensitive green LEDs to the right. We continue to be annoyed by the sleep behavior of the HPs, though. Like others we tested, when an HP goes to sleep, pressing the Power button does not cycle the power. It wakes it. So you have to press the Power button twice to shut it down. As a USB device, this can be annoying if USB activity wakes your computer. You may hit the Power button, for example, thinking the printer will shut down and then put your connected computer to sleep. But the computer will come back on right away because the printer has merely woken up. The smart solution to this is to restrict the Power button to cycling the power, not waking the printer. 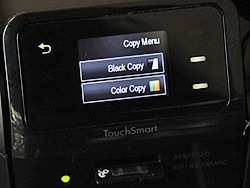 Waking the printer should be the responsibility of the LCD (and USB port), which should respond to any control you press (other than the Power button). You know, if we ruled the world. 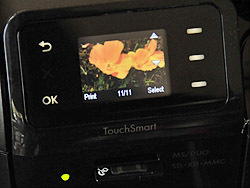 We did very much enjoy using the TouchSmart on the C4680. The decision tree is very clear and easy to manage, even better than Canon's (our previous favorite). HP isn't wrong to beat its breast about how simple it is to use the C4680. If you've never used one of these before, you'll get more done sooner with this one. The tiny 1.5-inch LCD lets you know what's going on during installation and guides you to whatever the printer expects of you, so you're already friends by the time you're ready to do something. The screen is initially divided into three buttons for Scan, Photo and Copy but don't tap them. The LCD itself isn't the touch-sensitive part of the interface. Instead, there are three touch-sensitive areas to both the left and right of the LCD. On the left are the Back, Cancel and OK areas illuminated with icons. On the right are three little light bars corresponding to the three options on the LCD. You should tap those bars rather than the LCD. That's about the simplest interface we've ever seen on an all-in-one. The only physical button is the Power button, everything else is handled by the touch screen with what amounts to just four options: Go Back, Cancel, OK and Select. No scrolling, you'll note. That's handled rather elegantly by two of the right-hand buttons when necessary. Well, installation may have been a breeze, but it was apparently incomplete. When we first put a memory card into the printer's card reader. HP Photosmart Studio popped up ready to do something just as the printer complained (through the HP Message Center application) there were no photos on the card. Card Reader Menu. 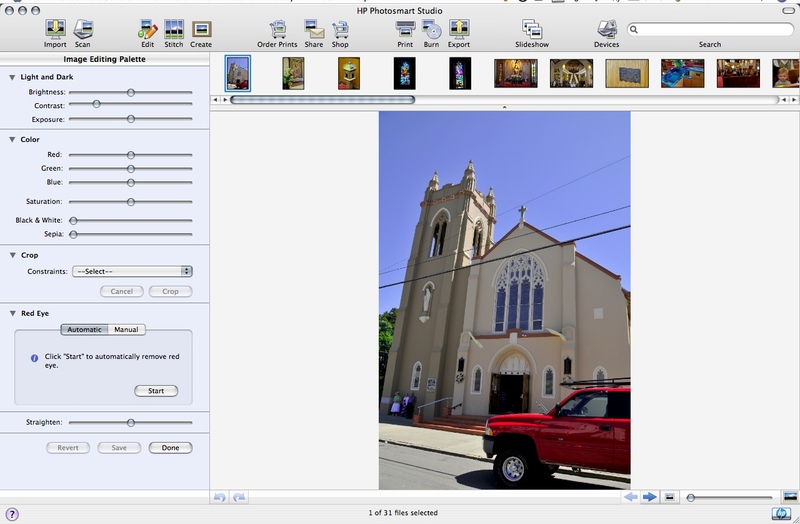 An image displayed (top) and the settings once selected to print. On the left are touch-sensitive buttons for Back and OK.
And it kept popping up, rather rudely, even after we Quit several times (was it scanning our drive for images; it never explained). Same old with HP software, apparently. We had to disconnect the USB cable to get any peace. That approach conflicted with our preferred way of handling card readers -- we really didn't want the C4680 behaving like a USB card reader. We wanted to disable it. While HP Studio has a manual Import command (which did see the C4680), there was no Preference to turn off automatic activation. 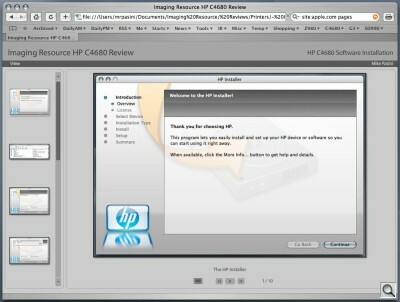 We thought HP Device Manager might be what we needed (it lists a Transfer function for the C4680). But running the Setup Assistant only offered to install an ink supply widget. And clicking on Transfer Images only brought up Image Capture (our preferred, but automatic, method). Back at the printer, we elected to select Photo for the Photo menu after loading the tray with 4x6 HP Premium Plus glossy photo paper. 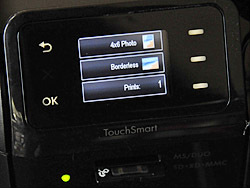 Three options: Memory Card Print, Photo Original Reprint, Passport Photo Print. We went with Memory Card Print and were shown the last picture on the card. The three options on the right were: Scroll Up, Scroll Down, Select. We scrolled to an image we wanted to print and pressed Select. Then OK (we were done selecting). That showed us the image with three new options: print size, border/borderless and quantity. Pressing the size button cycles through the available print sizes. Pressing the borderless button toggles between borderless or with border. And you can crank up the quantity to 99. And then all you need is to press OK to print. We liked almost everything we printed on the C4680. Our card reader print was sharp with good color, no dots discernible without a loupe. In the resolution game, we have to give the prize to Kodak (no dots discernible even with a loupe). Canon and HP are very close to each other, Canon with a nearly undetectable edge. At normal viewing distances, you can't tell any of them apart, of course. What impressed us, though, about the HP was how it printed photos on plain if very smooth paper from Pages. They were quite crisp with excellent color. Copying is the least technically demanding job an all-in-one does, scanning at high enough resolution to faithfully reproduce any document as if it were an original. The only limitation is page size. The scanner handles letter-size sheets only, not legal. Copy Menu. Two options: Black or Color. But even copying can be challenging when the original is a photo. The Photo menu's Photo Original Reprint will scan a print you put on the glass, show you what it has captured and, if approved, print it. We copied a 4x6 print of a child against a red background and we're very pleased with the results. 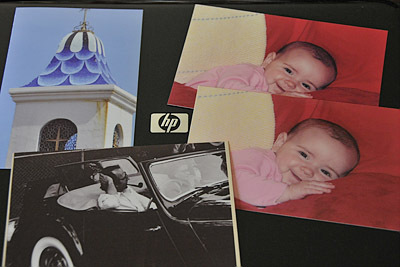 Compared to the Canon MP series, the HP print was not as much enlarged to make a borderless print. Color was good although the darks, as on the Canon print, were not quite as deep. Still, the print was sharp and vibrant. It would be easy to confuse the original with the copy (the copy is slightly enlarged). Copying photos may seem arcane these days but there are a lot of shoeboxes full of 4x6 prints in the world. Even if you find the negative, the fizz is flat by the time you get a print back from some lab. It could almost be a party activity to find a print (even an old black and white from the early 1900s) and make a copy to take home. You'll often find, as a bonus, that the copy improves a few problems on the original (like exposure or sharpness). There is no option to print your photo in black and white instead of color. Our black and white copy print had a magenta cast to it and lost the shadow detail. We much preferred the Canon MPs for black and white photo copies. 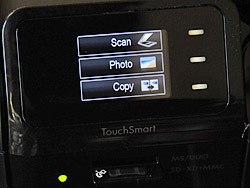 In addition to scanning to print (as in copying a document or photo), scanning options on the C4680 include scanning to your computer and scanning to a memory card. 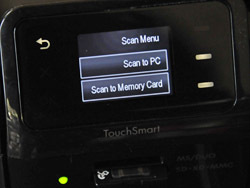 Scan Menu. Two targets: PC or Memory Card. But scanning on an inexpensive all-in-one tends to be a disappointing experience. It isn't so much the bit-depth that's the issue (although the HP's specs claim only 8-bit grayscale scanning, yet 48-bit color -- meaning it samples 16-bit channels in color but not grayscale, although it only delivers 8-bit color channels for 24-bit color). Nor is it the resolution. It's being able to see detail in the shadows (the dynamic range, really). Rare is the all-in-one scanner good enough to make credible (if not professional) film scans. But even scanning prints can be a challenge for some models. And it was a challenge for the C4680. We scanned a black and white print using both the 8-bit grayscale and 21-bit color options (48-bit wasn't listed on the HP Scan Pro TWAIN plug-in). We set the sampling rate to 300 an inch and let it do an auto correction for tone and color with medium sharpening. The grayscale scan was unusable. Resolution was poor and tonality was almost posterized. Worse, the sharpening seemed to introduce ghosted images it was so bad. The color scan was significantly better but had a strong yellow cast. We didn't see the ghosting but we did see a lot of artifacts (stair-stepped diagonals). A quick trip to Levels cleaned up the color cast and gave us a reasonable image. But reasonable doesn't get you a recommendation. The C4680 isn't much of a scanner, easily bested by its competition. While we did like the small TouchSmart touch frame, we weren't happy with how the card reader integrated into our real world setting. And while the box itself is attractive (particularly to dust and fingerprints), the image quality was not up to the competition in either scan quality or black and white printing. But the strength of the C4680 is its simple interface, color text printing, 4x6 photo printing and its low initial price, making it a good choice for the college dorm room. But for the home office or the amateur who wants to make nice prints, it's still behind the quality of its Canon and Kodak competitors.